legal when prescribed by a physician. California is now one of a smaller but growing number of states that has legalized possession and use of the drug for recreational purposes as well. Despite the increasing amount of legal approval the drug has received nationwide, many employers continue to disapprove of pot use among their workers and fire the employees for using marijuana, even medical marijuana. In contrast, a Massachusetts court has ruled that workers in that state who use marijuana pursuant to a doctor’s prescription may not be fired for testing positive for marijuana use. Massachusetts’ Supreme Judicial Court ruled that a worker from Massachusetts who was employed by a California-based company could not be fired for her use of medically-prescribed marijuana. The worker used marijuana to treat Crohn’s disease. She was fired after failing to pass a drug test to which the company subjected her. The court ruled that, since use of medically-prescribed marijuana “is as lawful as the use and possession of any other prescribed medication,” companies were barred from firing workers who used the drug pursuant to a doctor’s advice and prescription. 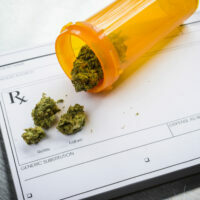 The court’s opinion described discrimination against a patient prescribed with marijuana as being a form of “handicap discrimination,” for which the worker deserved a reasonable accommodation. The court ruled that companies would need to negotiate a compromise with the worker, such as requiring that the drug be used only when the worker was off the clock, or asking the worker to look into alternative medications. Proposition 64, the California ballot initiative approved by voters in November of 2016, makes it legal for California residents to use marijuana recreationally, but the law offers no protection for workers who use the drug. In fact, the law contains a provision which grants specific permission for employers to test workers for marijuana use prior to hiring them or at any time while an employee. The law also grants employers the right to fire workers for testing positive for marijuana use—whether the use was recreational or medicinal—whether or not the worker was found to be high at work. The California Supreme Court ruled in a 2008 case that a telecommunications company could legally fire an employee who used marijuana for medical purposes. That said, a number of California employers have announced that they will no longer be testing their workers for marijuana use, and others have adopted a policy of testing workers for pot use only if they operate heavy machinery or are suspected of being high on the job. The important fact to note is that, while employers aren’t required to test workers for drug use, they have the right to do so, even where the test is not aimed at detecting that a worker has used an illegal drug or that they are under the influence of a drug while on the job. If you’re an employer attempting to develop workplace policy on drug use, or an employee who has been the victim of discrimination in the workplace, contact the seasoned and trial-ready Bay Area employment attorneys Rand Stephens & Richard Koss. From the San Francisco Peninsula, contact Richard Koss at 650-722-7046, and in the East Bay, contact Rand Stephens at 925-757-1700.